Ebola knows no borders. Ebola is a spirit! Udoh returns from a trip to find his whole house in quarantine! 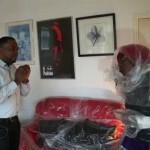 Affiong shows her caring side by insisting that Udoh goes into quarantine too.